In case you don’t know what SEO is, SEO is a bunch of methodologies (some technical, some not) practised and implemented on your website in order to increase your ranking in a search engine’s index. The higher your website ranks in any given search engine, the more likely your website will be found and the more likely you will have website traffic. Traffic means customers which can lead to…you guessed it! You can’t even find yourself on Google. My guess is, you’re reading my blog article because you run an online business selling products or services but enquiries and sales are slow. They may even be dead. When you input your own company name or brand name, nothing comes up in the index. Zip. Nothing on page 50 of the index. Not even page 100. If this is you, don’t despair. You’ve come to the right place. This is part 1 of my “SEO for Beginners” series of blogs which will help you identify and diagnose simple problems by yourself. Throughout the series, I’ll be offering simple, best-practice techniques that will put you in the good graces of Google, Yahoo and Bing. You’ll be on the search engine map in no time. 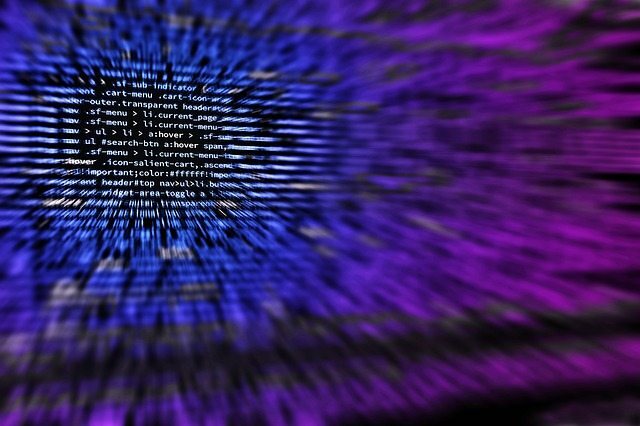 When Google, Yahoo and Bing are trying to work out what to serve a user after executing a search, a robot runs around the search engine index trying to match the user’s keyword search with various content elements of a page. If there’s a match between the keyword and those on-page elements, the page will be served to the user from the index. Now, keep in mind, for this to really work, there needs to be a correlation between the above elements. This means the keyword you select needs to be present in these on-page elements. Also keep in mind, for any given page, you should only use ONE keyword per page. If you use the same keyword across all your pages, you’re setting your pages to compete against each other. This confuses the hell out of search engines — they’ll drop you in the index listings because it makes them grumpy! The page title is the first element robots read when they’re trying to identify, index and serve your page. The page title is an element that sits in the source code of your website’s pages. But to human beings who have done a search, it looks like the below. See how the keyword “basketball cards” sits in the top row of the result that has ranked first? Remember, “page titles” don’t sit on the web pages themselves. TIP – When you drop a keyword into your page title, front-load it. Google is particularly sensitive to the first 3 to 5 words of a page title. Make sure the page title is no longer than 55 characters. The meta description is the little bit of descriptive text that sits beneath the page title (the blue text) for any given search result. Search engines no longer reward usage of the keyword in meta descriptions but dropping the keyword into a meta description is still crucial for usability. It helps entice your users to click on your page. See how in the below image the keyword is actually bolded in the meta description? Great! It will help users determine if they want to read the page. But see how the description ends on a …? This is because the meta description is too long. TIP – Don’t forget to drop your keywords into your meta description. Make sure your meta description is no longer than 160 characters, otherwise you’ll get cut off and annoy your users. Those users are potential customers! 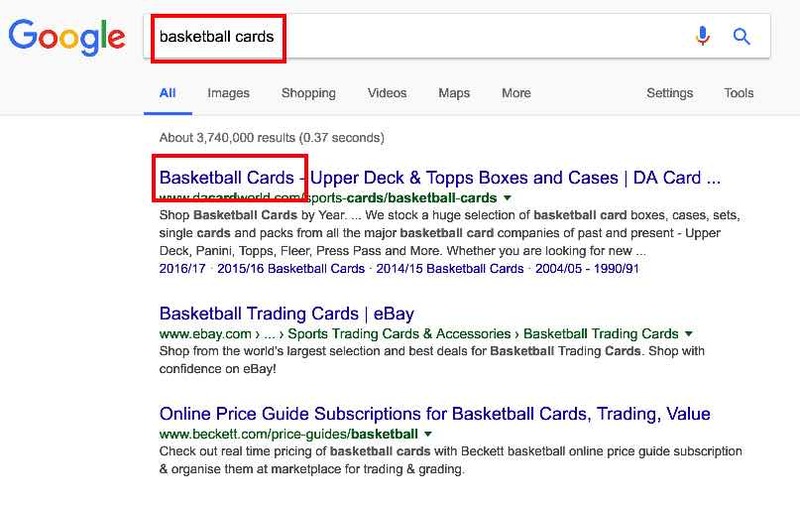 When the search engine robots have made a successful match with the search for “basketball cards” with the page title, the next thing they look for is the H1 tag. Every good webpage on the internet has a H1 tag. If you don’t have them, your web pages suffer. In turn, your business suffers. H1 tags are almost always at the very top of a page. If you’re utilising a blogging platform like WordPress, it’s likely the title of your blog will automatically be marked as the H1. The below example shows you how the H1 sits on-page (on the left), but it also shows you how it is seen by the search engine robots (on the right). TIP – Make sure your page has a H1 tag and the keyword is dropped into it. Use only one H1 per page. Never style your text using H tags. Again, front-load the H1 if you can. As you know, most pages on the internet have text on them. To marketing and advertising people, this is called copy, body copy or copywriting. Keep in mind, with writing for the web, your first priority is your readers. Human beings. Make it a good read for humans first, robots second. If the page reads well and it’s logical for the keyword to appear on the web page a lot, search engines will work this out. But if it isn’t, search engines will mark this as a red flag, freak out and penalise your site by dropping you in the index or worse, removing you from the index entirely so you can’t be found! Let’s go back to the “basketball cards” example. The page is a long one. I’ve captured a few choice bits so you can see what you SHOULD DO – and what you SHOULDN’T. 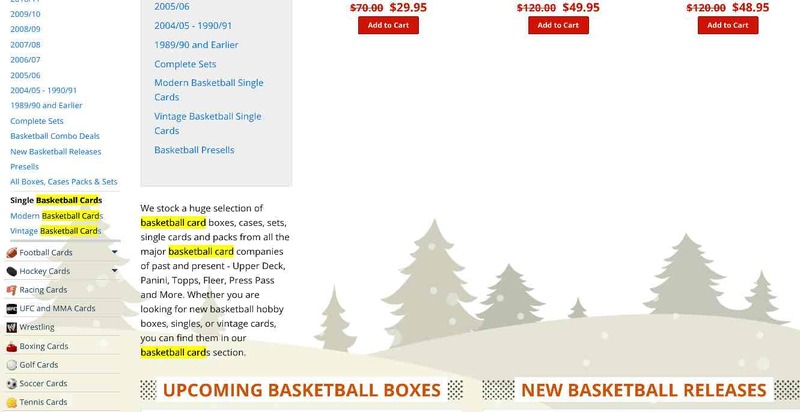 See how “basketball cards” (highlighted yellow) has been dropped into the copy? Towards the bottom of the page, “basketball cards” is dropped all over the place again. I’d say so, to the point the copywriting reads poorly. I’d say this page is on the borderline for a red-flag with search engines. 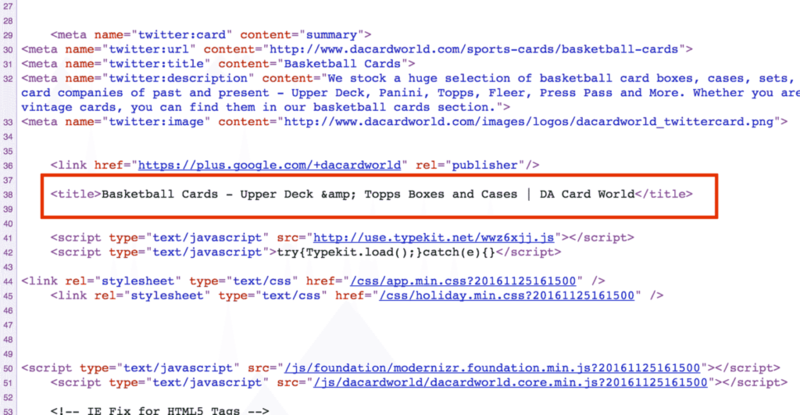 The very fact the keyword “basketball cards” is everywhere has helped it rank well but it’s likely the website owner will be hit with a warning sometime soon. Don’t do this. TIP – Sprinkle your keywords throughout your copywriting but don’t go over-the-top! Make sure you have at least 300 words of copywriting on each page. 400 to stay safe. The “dark-art” of SEO demystified, just a little bit. So there you have it. Part 1 of my SEO for Beginners blog series. Page title, meta description, H1s and content are some key on-page elements you should take a look at if you can’t find yourself on search engines. When you go into your web pages and update these elements, I’d love to know if your rankings improve. In my next article in this series, I take a look at some more on-page elements which can improve your pages further. I’ll be discussing URLs, image titles, image alt text and use of more H tags. Ready? Read here.